These days I normally don’t do whisky reviews, and for good reasons. There are plenty of websites out there that do good reviews and many producers have cottoned-on to the whole language of whisky reviews. For the Glen Garioch 1797 Founder’s Reserve (hereafter Founder’s Reserve) I’m going to make an exception, for the simple reason it’s a rather wonderful whisky and, if you are standing in front of a bottle at duty-free shopping somewhere in the world, I hope I can convince you to buy it. Let’s quickly run through the background story for this whisky and the distiller that produces it. The distillery is situated in North-East Scotland, 17 miles from Aberdeen in the village of Oldmeldrum. As the Glen Garioch website states “Glen Garioch is the most easterly Scotch Whisky distillery not just in Scotland but the world.” The last part of this claim to fame seems rather redundant to me as, I assume, a Scotch Whisky distillery could only be located in Scotland. Tasting Notes: Characterised with a sweet vanilla, butterscotch & fresh green fruits, sweet buttercream and citrus cleanliness result in a fresh gentle finish. Having got this out of the way, let me tell me throw my own whisky-thesaurus at you. Before I start I should mention one key point. Price: This is a strong 48% alcohol by volume product. If you are thinking of buying the 1 litre bottle remember this. Whisky is normally aged at around 70% alc./vol. When bottled it’s diluted with water, normally to around 40% alc./vol. On top of this remeber that most supermarket bottles of whisky are only 0.7l. Do a quick calculation, your litre bottle at 48% is giving you ((.48-. (0.7*.40)/(0.7*.40) * 100) 71% more whisky than your typical high-street 0.7 l bottle. In Germany I bought the litre bottle for c. €37. Converted to a standard-whisky 0.7l bottle with 40%alc./vol, this works out at around €21.58. So if you would pay that at your local supermarket, then this bottle gives you the same value. Enough maths. Colour: vibrant orange. If you were Dutch you’d be happy to drink this on Koningsdag. Taste: Sweet, slightly peachy, orange, caramel and a hint of chocolate. Finish: Short, again with a hint of chocolate, something minty and cinnamon. Bottom Line (5 out of 5): I like this whisky. for a start it’s good value, but more importantly it’s a very pleasant drink. Interestingly, it’s almost converted my wife from a gin drinker, which is no mean feat. Now that Winter is coming to the northern hemisphere I can see this bottle disappearing quickly. Please try it, and please give your reaction in the comments. 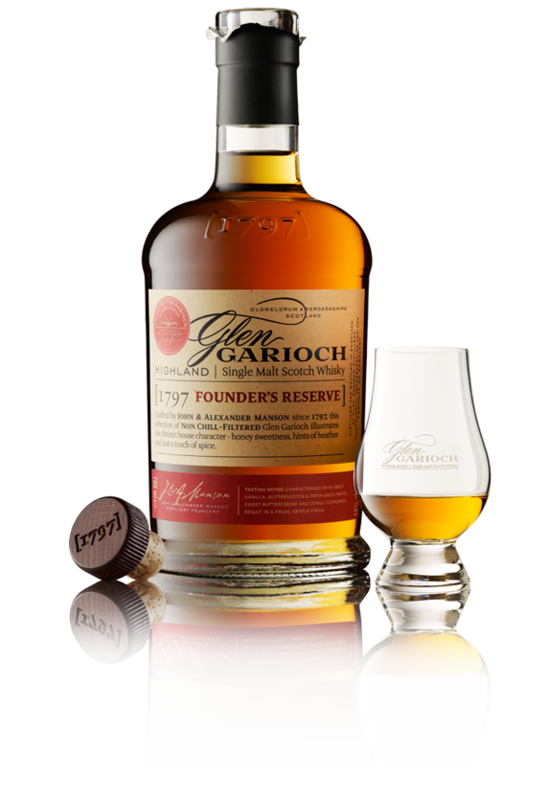 This entry was posted in Glen Garioch 1797 Founder's Reserve, Whisky, Whisky Reviews and tagged Founder's Reserve, Glen Garioch, Glen Garioch 1797 Founder's Reserve, whisky, whisky review. Bookmark the permalink.